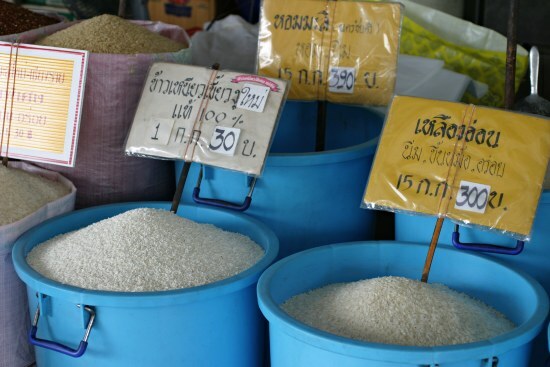 Rice Soup is a Chinese-Thai thing… It’s eaten for breakfast or late-night meals. Rice Soup is an excellent thing to eat while sick. 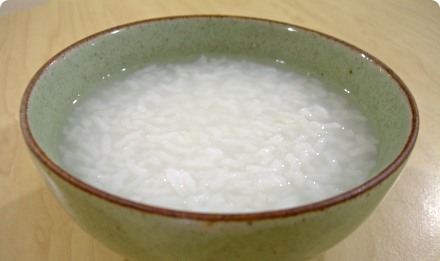 If you’ve got the cold or a flu, or even an upset stomach, rice soup will make you feel better! You eat this with a variety of small strong flavored dishes. Hopefully I can post some of those recipes soon. Boil the water & rice together in a pot on high for 3 minutes, then simmer for 20 minutes. Stir every 5 minutes or so, or the rice will stick to the bottom of the pan. Make sure to skim off the skin on the top of the water before stirring. Rice Soup goes well with Thai Pumpkin with Egg. It can be kept in the fridge overnight, but don't keep it for longer than 2 days. We would make this but add with ground pork or chicken with ginger to the soup in clumps. Once the meatballs float, it is cooked. 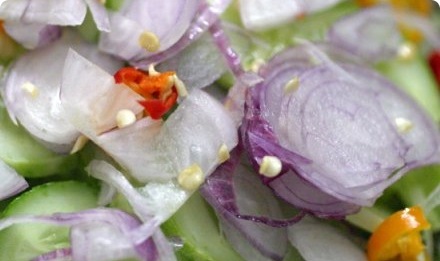 You cannot forget about the numerous condiments like peppers, limes, cilantro, nam plah, vinegar. I make this when I am getting sick and this is awesome for a hangover. Mmmm…with a Thai omlet, lup cheong (chinese sausage), yum goong haeng, stir fried garlic chicken, or any other intensly flavored tidbit. Great way to use up little bits of leftovers the next morning…But remember to eat in a manner similar to how regular rice is eaten. If you dump the food in the soup, you will get a real mishmash of flavors.